This weekend marked the opening of the Osaka: Mysterious Rebellion ~Escape From Namba's Hidden Castle Town~ (Side Story) event in the Namba Walk complex, so Capcom posted an update with details of the 'top secret mission' that visitors can sign up to help with. The update also showed off the set of three exclusive postcards which are being given out to visitors who manage to successfully clear the mission. The strange dog is the shopping centre's Namba Wan (a deliberate pun on 'Number One') mascot character. It seems as though the first day was a success as several fans I follow on Twitter were tweeting pictures from the area showing the mini gallery (with seiyuu signature boards) and Sengoku Basara booth. The whole thing reminds me of the room escape puzzle challenge from a few months ago; I hope they can keep running fun events like this to encourage fans of all ages to learn about history and the Sengoku Basara games. There still hasn't been much information posted about the next issue of Sengoku Basara Magazine due out at the end of this month. However, a preview picture was published a while ago showing artist Sumeragi's illustration which will be used for the rubber strap; it looks as cute as expected. Here are the most recent BASARA Sengoku HERO columns from Sengoku Basara series director YamamotoD, which discuss how the characters were originally created and the historical references they incorporate. There are still ten more of these columns I have yet to track down, since it took me a while to realise they were running bonus 'excursion' chapters in Dengeki Maoh as well as the normal ones from Sengoku Basara Magazine. 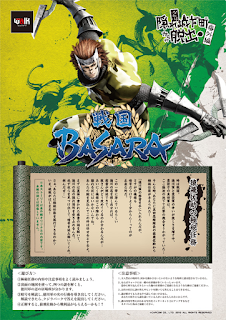 The very latest column coincides with the upcoming issue of Sengoku Basara Magazine where Sarutobi Sasuke is headlining most of the coverage. Since there's not so much real-world history associated with Sasuke, there were a few hints about the upcoming game woven into the article too. The column sets the tone with a headline which sums Sasuke up as someone who can be both a serious realist and a comical 'straight man'. 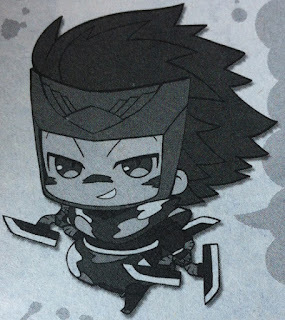 Back when they were coming up with characters for the first Sengoku Basara, they wanted to include some 'ninja stylishness'. YamamotoD has loved ninja ever since he was a child; he was raised on tokusatsu shows like Kamen No Ninja Akakage and Kaiketsu Lionmaru. Later on, he got into manga such as Shirato Sanpei's Kamuiden ('The Legend Of Kamui')... and joked that he was showing his age by mentioning these particular titles. In any case, he thought that if he was going to make a Sengoku-era series he definitely wanted to include ninja too. And the one he chose for his idea of 'ninja stylishness' was Sarutobi Sasuke. The interviewer remarked that the ninja Hattori Hanzou is probably very well-known amongst the general populace. Why did they choose Sasuke over Hanzou? YamamotoD personally favours Sasuke over Hanzou when he thinks about famous ninja. So much so that he'd have liked to create stories about the Sanada Ten Braves outside of Sengoku Basara if possible. Incidentally, while the other Sanada Ten Braves don't appear within the Sengoku Basara games, Kosuke, a young boy who appeared in the Takarazuka musical Sengoku Basara -Sanada Yukimura-hen-, was based on Anayama Kosuke from the group. With Takeda Shingen and Yukimura being the way that they are, the team gave Sasuke the roles of level-headed 'straight man' and narrator in the Takeda army to complete his personality. In the first Sengoku Basara game his job was to assist Yukimura, but when Yukimura drops down to rock bottom in Sengoku Basara 3, Sasuke confronts him properly for the first time and even ends up supporting his master emotionally. To Yukimura, Sasuke is like a reliable older brother. From Sengoku Basara 4 onwards, Yukimura has matured and the pair's relationship develops into a more equal, close friendship. Of course, Sasuke is still the more grown-up of the two of them. Sasuke's more serious side was evident in Sengoku Basara 3 and Sengoku Basara 3 Utage. YamamotoD thinks that he displayed a rather 'severe' streak in Sengoku Basara 3 Utage in particular. One part he liked a lot was a scene where Sasuke infiltrated the Mouri army in the first chapter of his story mode, exchanging secret codes with his subordinates. It's a scene which depicts Sasuke acting like a genuine ninja on a covert espionage mission. However, there were some comments that the way he was depicted in Sengoku Basara 3 Utage was way too serious, so with Sengoku Basara 4 he's back to being the 'usual Sasuke' with his running commentary. The interviewer asked YamamotoD to talk about Sasuke's relationship with Kasuga since she often seems to be involved with what he's doing. YamamotoD disagreed; even though they have a lot in common - they're both ninja, after all - the team hadn't really settled on any solid links between the two of them back when the series began. It was only from Sengoku Basara 2 onwards that their relationship began to take shape. Although Sasuke is often hitting on Kasuga, it's not due to unrequited love. His feelings are more like those of an older brother looking out for his little sister. He can't reveal the full details yet, but in Kasuga's story in Sengoku Basara 4 Sumeragi there's a scene which touches upon the pair's past. It's a fragmented scene which shows the connection between the former Sasuke, who could only view other people as 'monkeys', and the current Sasuke. Fans who are interested in that should definitely check it out. Other things that Sasuke fans should look out for in Sengoku Basara 4 Sumeragi include his new story where he becomes involved with Matsunaga Hisahide for the first time in a while. With regards to his move set, we can look forward to him fighting in a more and more 'ninja-like' way; there's a new technique where Sasuke suddenly vanishes and reappears behind the enemy, and they've added a dash attack too. Finally, the interviewer asked how YamamotoD would like depict Sasuke in the future. He answered that it might be interesting to see a trip back to his village or something similar . However, even Sasuke doesn't tend to want to talk about things relating to his past. There was a scene in the second chapter of Kojuurou's story in Sengoku Basara 3 Utage where he mentioned his village; anything more than that might be tough. I also got hold of the previous issue which talked about Takeda Shingen. Shingen was introduced as a hot-blooded, heroic man of fine calibre; a wise ruler in a turbulent era. The interviewer called him a 'big name' (in English) who is said to represent the warlords of that time. Naturally, the first topic was YamamotoD's favourite story about the real-life Shingen. When it comes to Shingen, it has to be the 'Fuurinkazan' written on his banners. YamamotoD considers him a great man on par with Oda Nobunaga - yet there are a surprising number of anecdotes about Shingen which give a sense of his day-to-day lifestyle. His love of flushing toilets, promoting the consumption of houtou stew in his camp; even Shingen's Tsutsujigasaki Yakata castle seems more like a home than a fortress. These stories about Takeda Shingen are somehow reassuring. He's portrayed as a man of substance in the Sengoku Basara series too; a high-ranking, celebrated lord. While he's deeply benevolent and warm, he's also able to act with decisiveness in combat. As a ruler, Shingen's attitude makes Yukimura - and even Masamune - appear inexperienced and easily swayed by emotion in comparison. The first meeting between Yukimura and Shingen still hasn't been depicted in the game series to date. There are plenty of story ideas YamamotoD still has for the games which he hasn't had a chance to include yet. The meeting between the two men featured in the Takarazuka musical and the Shukumei! Kawanakajima No Kassen ('Destiny! Battle Of Kawanakajima') drama CD, so people who are interested can go ahead and pick those up. Incidentally, in real-life history Yukimura's father Sanada Masayuki was a hostage at first before being noticed and singled out by Takeda Shingen. YamamotoD really likes their relationship so he incorporated some of those elements into Sengoku Basara's Yukimura. He thinks that Shingen doesn't want Yukimura to grow up to become a regular warrior. He wants him to have a broader outlook and rule his people with compassion, so he gradually sets trials for Yukimura to overcome in order to help him grow as a person. One example of this was in the Sengoku Basara Judge End TV series when we see Yukimura meeting Sasuke; Shingen set it all up as part of Yukimura's training. The interviewer noted that Yukimura's fist fights with Shingen are a Sengoku Basara tradition, and it's amazing how they keep coming up with new ways for them to beat one another up each time. YamamotoD admitted that actually, when they're making the games the evolution of those fist fights is the hardest thing about Takeda Shingen. Performing a drop kick, tossing Yukimura with a giant swing, hitting one another at the same time; it's getting harder and harder to incorporate new material. They'll do their best with the next game too since it's something they definitely want to keep including! Both Shingen and Hideyoshi fell in Sengoku Basara 3, and Shingen's illness left a deep impression on the interviewer. Yet Shingen didn't die. YamamotoD thought that if Shingen had died outright, Yukimura's despair would have been too great and it would all have been over. Shingen had to live so that they could show Yukimura maturing. Shingen's full recovery at the end of one of Yukimura's story routes was a big surprise! Yukimura was depressed throughout Sengoku Basara 3 so the staff felt that they wanted to show 'the usual duo' right at the end. There was also a little more to it. The real-life Shingen made a request that his death should be concealed for three years, so they decided to turn it around. Instead of Shingen actually being dead, the Sengoku Basara version made it so he was really alive after all. They're using the Sengoku Basara 3 Utage version of Takeda Shingen as a base for his move set in Sengoku Basara 4 Sumeragi, with additional tuning and new skills. I... I ... awwww that's cute. Wonder what's up with all the flirtation then. Also, backstory, huh? Would be interesting if like Kasuga's the one who somehow humanized Sasuke from his "people are just monkeys" mentality. Also didn't know Masayuki was Takeda's hostage... makes me wonder if Yukimura being the Uesugi's hostage will ever come into play. All in all very interesting stuff! Hmmm... Perhaps until now we have not seen Yukimura being Kenshin's hostage, but in 3 and Judge End this historical fact would explain why Kenshin lends his/her army to Yukimura after they confronted each other. Knowing that Sasuke is only playing around when he teases Kasuga makes sense; I was never quite sure since he's so unreadable, but him actually being lovesick would be a little strange. Though it sort of makes me want to see what would happen if Kasuga actually responded to his advances, however ridiculously out of character it would be for her to do something like that (even as a joke) given how thoroughly committed she is to Kenshin. Sasuke seems to care about her quite deeply under all of the silliness so it would be interesting if he feels she helped him out in the past. I can see something like that sewing the seeds of a brother-sister relationship from Sasuke's perspective even if Kasuga had no idea something had happened. I like their complicated, lopsided relationship a lot. The comment about Shingen's toilet habits was news to me too though I double-checked and it does seem to be frequently documented. Oyakata-sama was ahead of his time! And that's a good theory about the hostage relationship. It certainly sounds like the kind of reference that YamamotoD would try to fit into the story somewhere and Kenshin's relationship with Yukimura is quite unusual. Perhaps we'll get more hints about that when I find the Kenshin article in this series sometime! Yeah, it makes a buttload of sense in retrospect. Though, I could kinda see her maybe psyching him out, like agreeing to his "advances", making him recoil, and thus her proving he's just joking so she can hold it over him and be all "stop pestering me you petulant monkey HMPH!! *grump*" It actually makes me appreciate their relationship a lot more.... especially compared to that origin story from the audio drama of them meeting and him deciding to follow her 'cause she was bathing. Huuuh, that's cool! It's neat to hear about all these little anecdotes! I can't be sure Kenshin has had one yet, but if not it has to be coming soon. They're going at a rate of 16 per year so I think they'll manage to cover everyone before the column ends, which is great - no favouritism towards the most popular characters! Awesome! Your friend is pretty luck since there are so many events around Osaka for this series. We have to spread Sengoku Basara fever everywhere! Do you think that any of the three newly-playable characters will have strange horseriding stances or something special like that? They've used up a lot of the ideas for weird riding styles already but I love discovering them. I guess Rikyuu might be sitting in a seiza pose and relaxing, but I'm not sure about the other two (actually I'm a little afraid to imagine what kind of weird riding style Maria will come up with, though it might just be an elegant side-saddle posture). I'm almost convinced Yoshiteru will get a unique horse, because I can't see him having a unique riding pose to set him apart from others- he's too regal for that. He definitely seems worthy of having something unique about his horse-riding, though, so a different mount like Hideyoshi might be the way! I definitely support the idea of a magnificent horse for the emperor/shogun/whatever he's called today! I seem to recall that there was a play demo where one of the testers ran towards a horse on the Kawanakajima Intrusion stage and KobaP waved them away... perhaps I'm overthinking it but it would be great if it's because he wants to show a cool horse off later. Though I'd imagine the play testers who attended the demo events would have immediately run over and peeked. I love those characters' columns ^_^. It's an interesting read. Keep'em coming!